This turned out to be a difficult topic for me! I thought I'd have no problem coming up with ten words or topics that automatically put books on my mental do-not-read list. Then I sat down to write my post and I had the biggest brain freeze. Horror/Thriller: Scary books are not for me. At all. I avoid this genre. I don't need to be creeped out and looking over my shoulder every five seconds while I'm reading! I also can't watch Criminal Minds when I'm home alone. What can I say, I'm a baby. Fairytale Retellings: As much as I love fairytales I just can't get into retellings. Time Travel: When a character is jumping back and forth so many times I start getting confused and can't keep up! Motherhood: Not at the point in my life and it is something that I don't want to be reading about. Poetry: I want to LOVE poetry. I've made myself read countless poems but I just can't get into it. Every one in awhile I'll come across a line or stanza in a poem that I LOVE but won't like the rest of the poem. Pirates: It's hard for me to follow along with pirate dialogue. Autobiographies: Always seem greatly exaggerated and sometimes not believable. Zombies: I just don't get it. There are exceptions to every rule so there is a very good chance I could love books about any of these things! Are there any books I am missing out on based on my list? YOU DON'T LIKE ALIENS.........How is this possible???? Aliens are AMAZING!!! Have to agree with you on Poetry, Motherhood, and Zombies though.....Zombies seriously creep me out! *shiver* And I personally Love Time Travel!!! Nice list though!! You have some great picks!!! I should have included chick lit on my list. The word is just loaded with sexism. We have fairytale retellings in common as well as time travel. And I hate the term chick lit too! Horror/thrillers can be hit or miss for me also. It's a nice exercise to figure out what you don't like in books, though it made me seem like I hate everything! Zombies always get me as well. I have a friend who's trying to convince me to read World War Z, but I just can't spend the money when I'm 99% sure I won't like it! Pirates! I didn't think of that one, but I usually steer clear of books that feature that. And I'm right with you about zombies, horror and aliens. Just not for me. Funny, I guess a lot of this depends where you are in your life. As a parent, I find good books involving motherhood really moving and relatable, but I'm sure I didn't feel that way before I became a mother! I do love time travel (if it's well done! ), especially The Time Traveler's Wife, and don't have a very strong opinion about aliens, although I did love The 5th Wave when I read it this year. Poetry? I'm with you on that one! I don't get it, and I don't want to try. And yes, also, to your dislike of the term chick-lit. Categorizing books by/about women that way feels really demeaning, and probably repels as many women as it attracts. However, I do love a good horror novel... I guess these lists prove, once again, that smart people can disagree! We have some of the same ones! AND there are some you had that I should have added because I completely agree with you... like pirates and autobiographies. But also like you I had trouble thinking of anything when I initially sat down to write my post so I completely understand where you're coming from. Thanks for an awesome list! Ah, poetry! That should have been on mine! Oh well. Here is my Top Ten . I completely agree with you on so many of these! I agree that I don't seek out horror, chick-lit, motherhood, poetry or zombie books either! It's also been a long time since I've read an autobiography... they tend to intimidate me and I worry they'll be boring. Excellent list, with lots of overlap with my own list. I don't do scary, I'm not crazy about monsters, and I have had enough of motherhood stories (I'm on the other side of the timeline) for my life. But POETRY? Eek. The teacher in me is coming out...and I feel I must urge you to take a look at this older Top Ten list of mine: Amazing Poetry for People Who Say They Don't Like Poetry. I also put Chicklit and Autobiographies on my list. Don't like reading them. I'm not into horror books either. I don't like to be scared. I feel the same way about motherhood books! I don't think of Horror and Thriller as the same thing. I enjoy Horror, but I don't like Thrillers. Try reading story poems, like Rime of the Ancient Mariner. That's how I got into reading poetry, because it could be a short story or novella if it wasn't told in verse. I'm with you on horror and chick-lit. They made my list too. And, I totally should've included poetry, cuz, it's not my thing at all. Good list this week! Motherhood and time travel - I am with you completely! I have started loving aliens! Thanks to Jennifer L. Armentrout. Zombies are pretty good to. You just need a zombie book with a little humor. Those are the best. ALIENS?? So no Obsidian by JLA?? Horror and zombies were on my list, too. *shudders* Aliens? They're fine in SF -- not the UFO, human-snatching kind, nor the Alien movies, but more in the Star Trek/Star Wars mold. I am a mother, so no problems there, and I love fairy tale retellings. I like time travel. I've read some good autobiographies. Chick lit, though? Depends on what is meant by the term. I like some books that would be classed as "women's fiction" and "contemporary romance," but not everything that falls under "chick lit". Poetry and Pirates - I never thought of these (and I could have used them since I didn't come up with ten! ), but now that you mention them I tend to steer clear, too. We are opposite, though, on Fairy Tale Retellings. Hate the term chick-lit, too. Great list! Zombies made my list, too. I just don't get it either. I love a good chick-lit book, but I agree that I hate the phrase "chick lit." Great list! Horror should have been on my list. I can't even watch previews for scary movies, much less spend hours with a book that has my imagination working overtime. I second you on the motherhood - it wouldn't cause me not to read a book, but it's definitely not a plot I currently identify with. In fact, I've been known to rate books lower when they use pregnancy as a plot device. It's like the author thinks, "The woman in this story needs to experience a big life change - I know! I'll get her pregnant!" Is that really the only substantial life change a woman can face? No! Everything on your list I would read. There are a few things that would have me not even attempt to read a book such as over hyped books. I'm with you on poetry and zombies, but Time Travel would probably be an incentive for me to pick up a book! Poetry and Zombies! I should have thought of those. I have never read a collection of poetry as I get bored and start flicking. Zombies just don't grab my attention either. I agree that this was a hard list to come up with. Chick-lit was on my list and I generally agree with you on Horror, Poetry and definitely Autobiographies! You can find my TTT here. Great list, Jen. I'm not an alien or zombie fan either; though I've read a humorous zombie story for the YA market that was good. You know, I was never a big fan of fairytale retellings until The Lunar Chronicles series by Marissa Meyer. My girls and I are reading Scarlet right now. Chicklit, Motherhood, Autobiographies, Poetry, and Zombies also made my list! I'm so glad zombies are on yours. I feel like everybody is obsessed with zombies and I'm just not... I should have put horror on my list! Great picks! Although I have to disagree with aliens. I freaking love alien books! This is my very first time participating in TTT! I have vampires and werewolves on my list, but I could have had zombies too. And time travel! I didn't even think of that one, the subject is so far out of my attention zone. 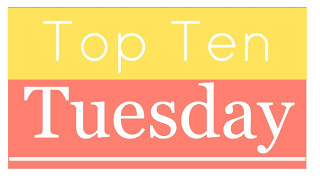 This is my first ever time participating in Top Ten Tuesday! Iol our lists are so similar. I swear Zombies make me pee like a scared dog. I will dabble in Thriller books, and very occasionally something labelled horror, so long as it's really mostly something else, and not too scary. But as a genre, it's definitely something I avoid. Love zombie books, though, especially ones with an interesting twist or a sense of humor. How can you resist a book titled Eat, Slay, Love? This prompt was tougher than I expected! :) thanks. I'm so late for this hop. But I made it, it's not Wednesday yet! I would've had zombies on my list, too... but then I picked up Warm Bodies and I absolutely loved it. I'm still not sure I'd pick up another zombie novel, though; that one was... different.